During my last trip to Kyiv, Dnipro and Donbas, I’ve been in several closed-door meetings with military staff and international strategists. The following text lists some of my observations and things I was told about realities of the war in Ukraine. All information was provided under Chatham House Rules, so it is much more straight forward than what you would hear or read from official briefings and politicians’ statements. For the same reason, I won’t name any source, naturally. 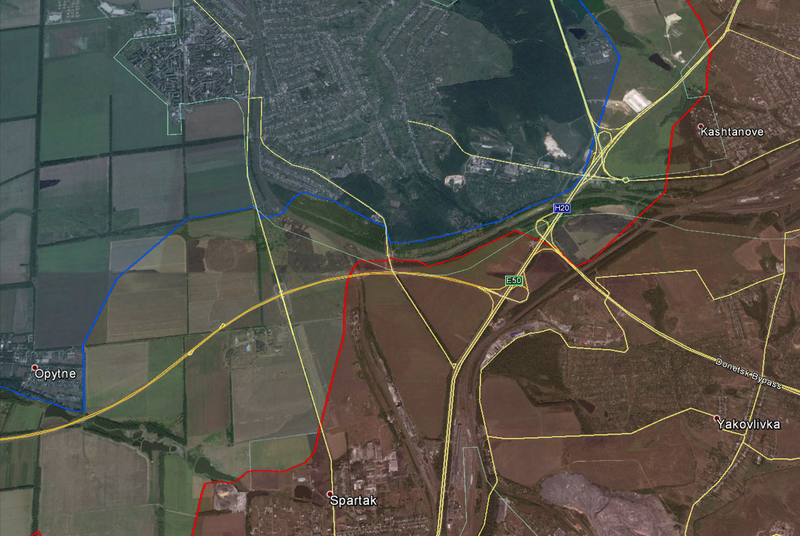 Right now, Ukraine faces some 36.300 separatists (most of them Ukrainians) at the front. While 2016 saw around 9.000 Russian troops in eastern Ukraine, this number declined to 3.000. “The problem is that they left their equipment all behind. High tech equipment.” Military academies and (Ukrainian) separatist army training bases work “highly efficient”, some still under Russian army command with many trainers being Russian-trained Ukrainians by now. 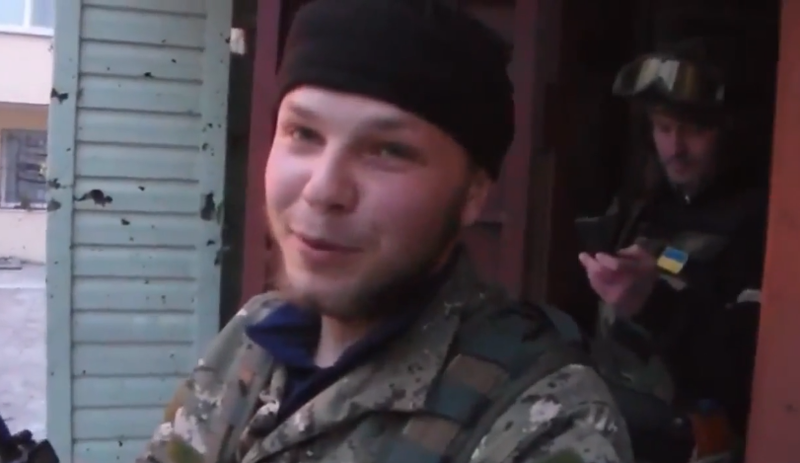 They are now training “the 3rd generation” of fighters, meaning Russian-trained Ukrainians educate new Ukrainians. Separatist troops are trained on traditional weapons as well as state of the art Russian Army electronic warfare equipment, the invaders left-behind. This results in a well-trained enemy army. However, over the past months, Russians have reduced logistic and military support in Donetsk and Luhansk. The DNR/LNR military and political leaderships are panicking about this and consider having their own offensive operations against Ukraine, fearing Russia might look for “diplomatic solutions” in which they might cease to exist. Right now, separatist/Russian forces of the first and second army corps have 478 operational tanks, 848 APCs and 732 artillery pieces inside Ukraine. Approximately the same amount of equipment is located directly on the Russian side of the occupied territories and can be deployed to the territories within less than one day (with Russian soldiers operating most of the weapons systems). What the Ukrainian army needs at the front – and hopes to receive from the US – is “night vision equipment, jamming systems, radio intelligence tools and secure communication systems, especially to operate UAVs”. One quite bold argument why drones must be equipped with night vision and laser targeting equipment was, that Ukraine wants to see where it returns fire. “70% of their artillery and mortar positions are located in close proximity to civilian structures in urban areas. Most of the shelling occurs at night. If we return fire, we would like to see what we hit. This would reduce the risk of hitting civilians.” The officer said that Ukraine must strike back if the pro-Russian fire in violation of Minsk threatens the lives of their forces. They do this almost daily, “endangering our own civilians” (in the occupied areas). They want to change the situation, but need more foreign support to do so. Also, separatists occasionally use entrenched BMP-1 some km from the front as “ballistic weapons”, using their main gun to shell the Ukrainian front “like mortars”. 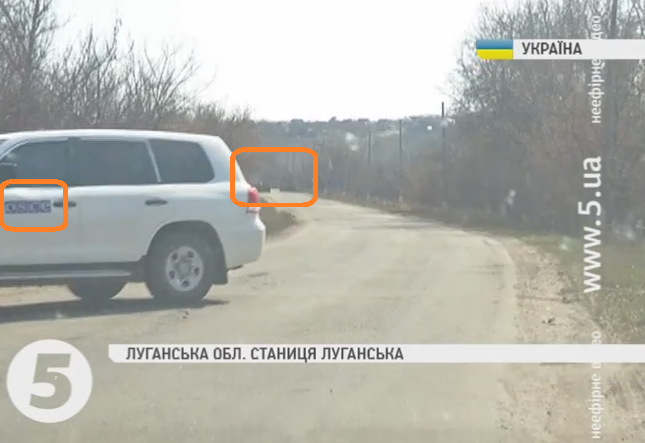 This tactic is used to avoid being spotted by OSCE monitors. It also only very seldomly causes damage or casualties. The European Union, also Germany, deny Ukraine the military support they want, because the EU wants the Ukrainian army “to punch below its fighting weight”. It knows Putin is the aggressor but also has no full trust in Ukraine’s commitment to the Minsk agreement. It fears, nationalist forces could win the upper hand via democratic elections or within the military structure and launch a surprise offensive to regain what belongs to Ukraine in the east. Some figures within the Ukrainian political and military sphere see this as the only chance as Minsk does not seem to return any square meter to its rightful owner. At the same time, the Ukrainian army feels – and is – much stronger than in 2014 and could throw its weight into the battle to see if it can recapture entire Donbas. However no one thinks that Poroshenko would order such an attack as another defeat would mean the end of his political career. To make sure, nobody in the Ukrainian leadership does, the EU wants Ukraine to remain under-equipped to a certain degree. Also it is afraid that IF Ukraine’s army became a proper opponent to what Russia can send it at any moment, the conflict could spiral out of control. The Ukrainian army position on the diplomatic initiative is: “Russia suffers under the sanctions, keeping them in place is the only way to eventually solve the conflict due to negotiations”. Some experts think that this implies, lifting the sanctions against Russia could make the Ukrainian government and army turn to “Plan B” as mentioned above. Asked about OSCE observations that the Ukrainian army sometimes advances into the grey area, officers made it clear that they regard the – signed also by Russia! – September 19, 2014 contact line as the real one, according to Minsk. This means the army sees advances into the grey zone “to supply our citizens in it” and possibly take new positions as its full right. 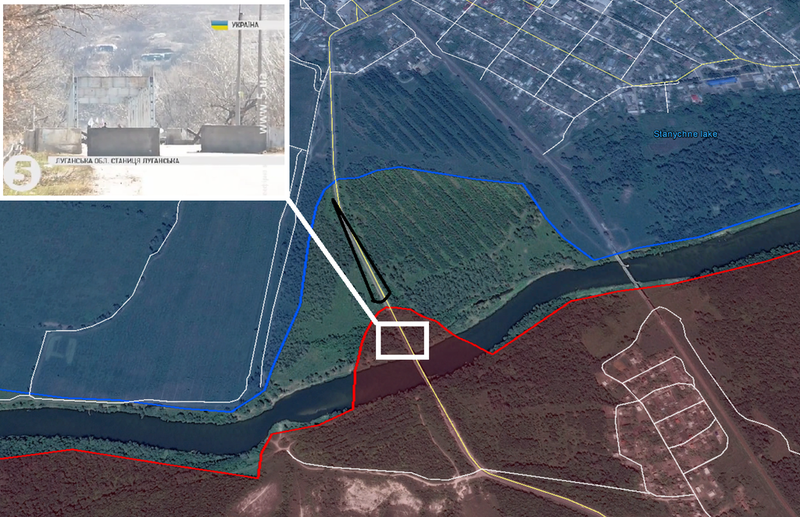 The grey zone, meaning points behind what Ukraine holds now but what it regards as on its side of the September 19, 2014 contact lin,e reaches “between 200 meters and 7 kilometres” into not-held territory, sometimes held by separatists, sometimes held by nobody. Thus, it includes “hundreds of settlements” which Ukraine regards as under its protection according to the first Minsk agreement. 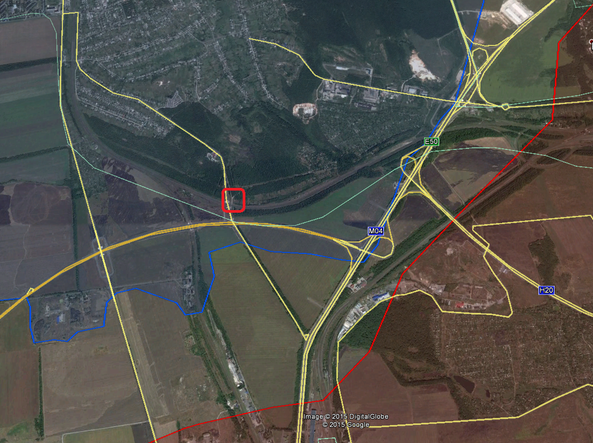 The army denies that entering these areas violates Minsk and left open, whether it could install permanent positions inside this area. For now, only temporary advances are on the agenda. Russian-speaking people could turn to Russia, fleeing to it or even rise up in the eastern and southern regions, trying to make those areas part of Russia. By the way: All experts agree that Russia is not better off economically, just more successfully creating that image with its propaganda, also received among many “neutral” Ukrainians. Because of all this, economic experts assume that Ukraine is “too big to fail” and must be economically secured at any price. So the fight against the economic downturn is closely connected to the fight against Russia’s hybrid war on the country and the fight against corruption. Against the backdrop of an – again – escalating war in Eastern Ukraine, it was revealed today that Russia extended its “support for the rebels” or rather: supply of its troops by a further mean, namely by a direct train connection from Russia into occupied Donbas. Given the fact that the Russian invasion command did everything to conquer the important railway knot of Debaltseve and seeing a steady escalation in Russian-led violence in Eastern Ukraine over the last weeks, the assumption that full-scale hostilities will resume until summer seems rather obvious. Thus, it is no surprise that the Russian army needs to create a strong and steady supply line to its forces in the Donetsk and Luhansk regions. Rumors that such line was established popped up here and there over the last 2 months, however, solid evidence was missing so far. 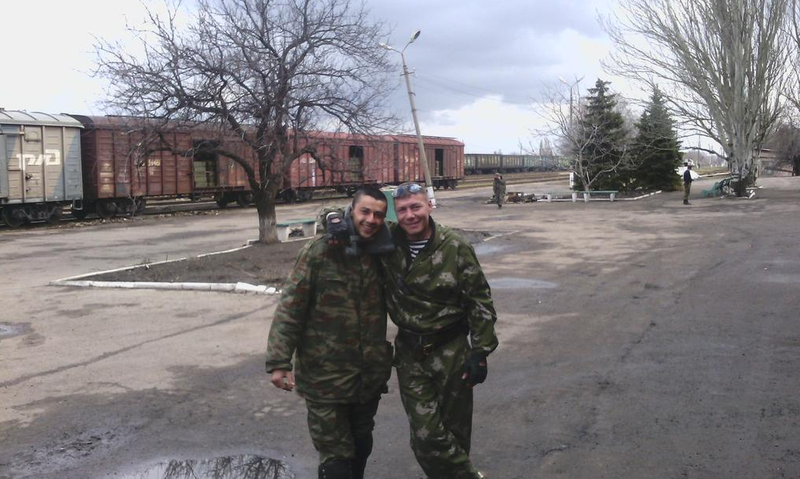 This changed today, when the Ukrainian Twitter user “Lenz Gottfried” uploaded a picture of two Russian “hybrid” troops, hugging at an undosclosed train station in front of what seemed to be a (state-owned) Russian Railways cargo train, packed with ammunition boxes. According to the uploader of the picture, the boxes contain ammunition for the «Акации» / 2S3 Akatsiya self-propelled artillery, however this type of artillery system is not known to have been deployed by Russian forces so far. 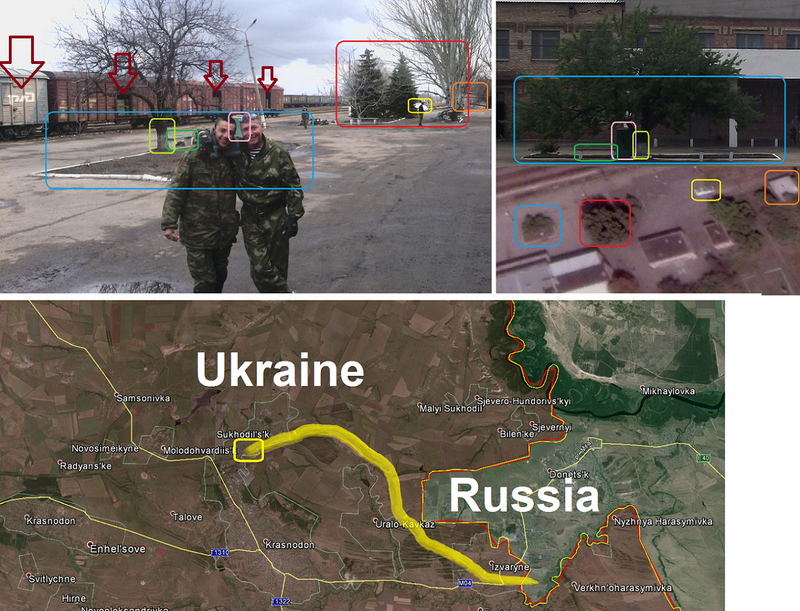 While this description might be a (rather unimportant) mistake given the clearly military cargo inside the wagons, the exact geolocation of the picture inside Ukraine was crucial to verify the claim that the scene played inside Ukraine. This process needed no less than 2 hours, in which I matched more than 50 train stations inside occupied Donbas with the picture, searching for a facility with the properties and objects that can be seen in it. Finally, I found the right one and was able to confirm that despite the small ammunition type error, the scene indeed shows what it claims, namely a direct Russian army supply line into Ukraine’s Luhansk region via railway, more precisely the town of Sukhodil’s‘k, around 10 km from the border with Russia. The below picture shows the analytical chart that verifies the location as well as the way, the train probably took to get there. As it can be seen in the chart above, the train likely entered via the Russian-occupied Izvaryne border crossing, which (despite claims to have done so) the Ukrainian army was never able to reach since the start of the invasion in April last year. Thus, it served as a safe passage for Russian troops and equipment, crossing it in vehicles as well as the notorious “humanitarian aid convoys”, since then. However its use for the illegal entry (aka invasion) of Russian army-organized and -stuffed trains hasn’t been proven so far. This changed today. The emergence of the train in Sukhodil’s’k, 18 kilometers of tracks into Ukraine, is – for sure – only the tip of the iceberg. At this very location, no Russian arms are needed right now and the town only serves as a transit point for that kind of carriage. 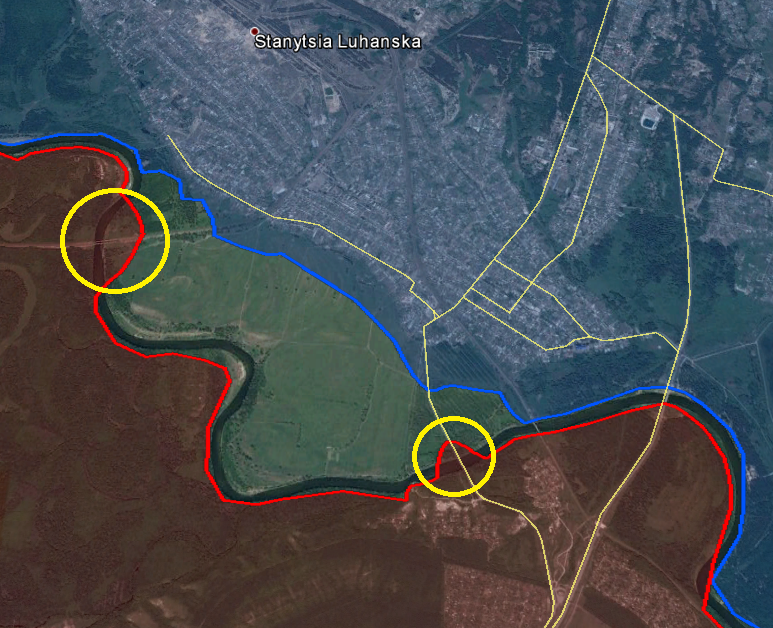 Instead the tracks, lead towards the front near Stanytsia Luhanska in the north and practically endlessly towards the west, where fighting increased over the last 4 weeks. More such deadly cargo, transported by train, should and will be found along these axes, then however, probably not in Russian Railways wagons anymore. 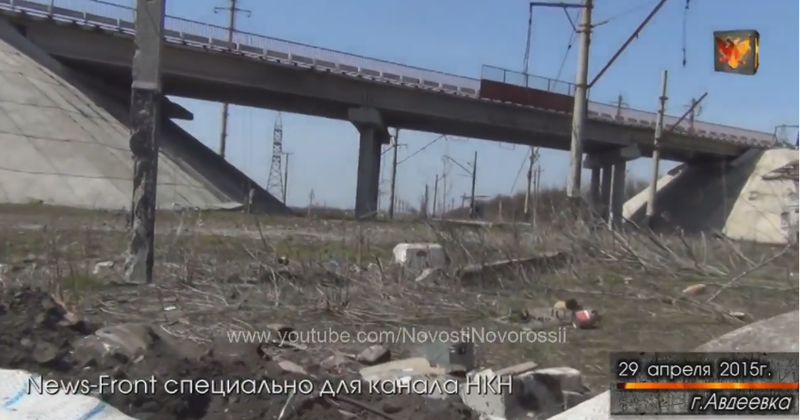 Finally, the first appearance of Russian state trains, filled with ammunition, inside Ukraine, is another stark reminder that this conflict is far from over. Instead the Russian side takes a – well-documented – deep breath to come back with all its “hybrid” force and take more territory inside Ukraine; probably before this summer. The usage of Russian trains to facilitate that carefully and long-planned move is just another logical step in Russia’s escalation ladder and thanks to the “media friendly” invasion troops, its revelation was just a question of time. Eight days after the fall of Debaltseve (article), many analysts still believe, the worst in terms of fighting might be over in eastern Ukraine and Russia’s thirst for more territory appeased. Fighting activity continuously decreased during the last days along the border of occupied Donbas and yesterday was the first day of no Ukrainian fatalities since the signing of the Minsk 2 agreement on February 12. Still, this impression deceives. The prediction, I stated in my last article, that large parts of the offensive Russian forces which were active in and around Debaltseve moved south after their victory there and will soon turn up in the greater Donetsk area as well as near the southern coastal city of Mariupol was meanwhile confirmed by multiple analysts, including several sources on the ground in southern Donetsk region. However, what seems not to have been realized by analysts and international media organizations yet is that the question, whether or not an attack towards Mariupol will take place or not has already been answered. 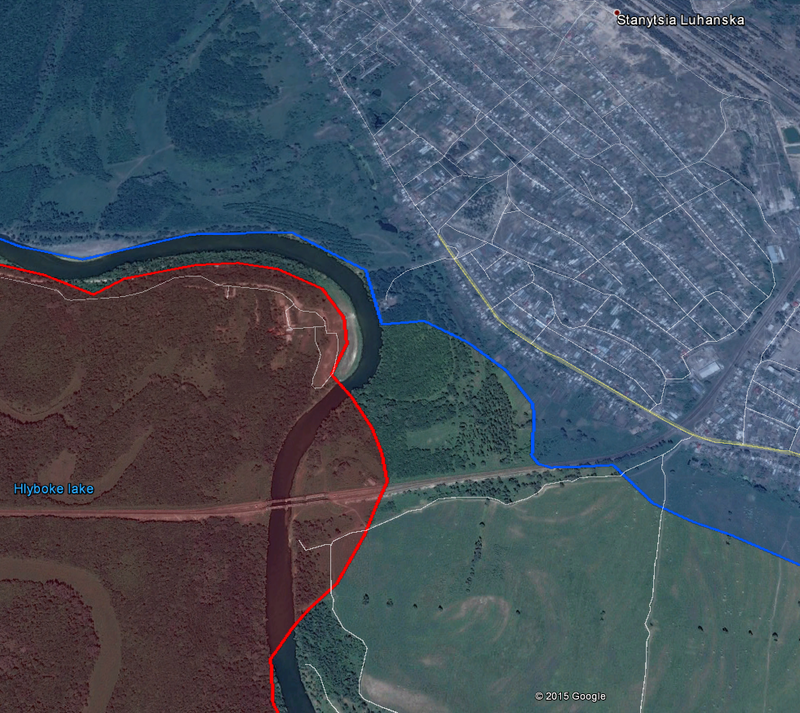 It started the moment, Debaltseve fell to the invasion army. In early February, Ukrainian national guard forces from Regiment Azov were not willing to obey the suicidal “defense only” strategy by the military and political leadership in Kiev and decided to go on the attack (article), amid a weak Russian / local separatists-held frontline east of the city (as most forces were active around Debaltseve). 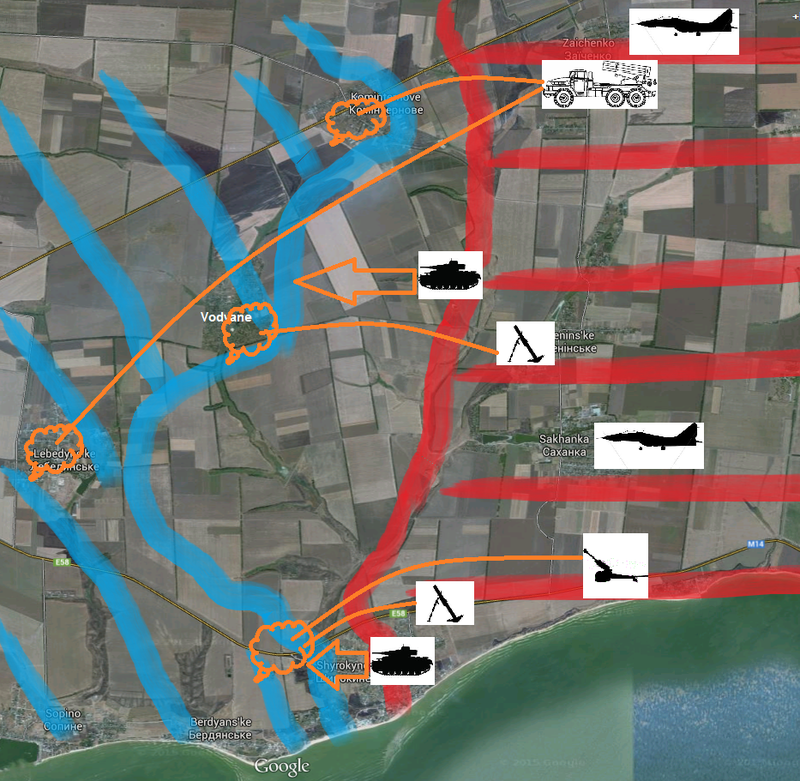 Within 2 days, they recaptured around 120 km² of Ukrainian land and established new fortified positions in a number of towns, some 10-15 east of Mariupol.The below (professional) map gives a good impression of what could be regained and put back under Urainian control during this offensive. But the joy was only brief. 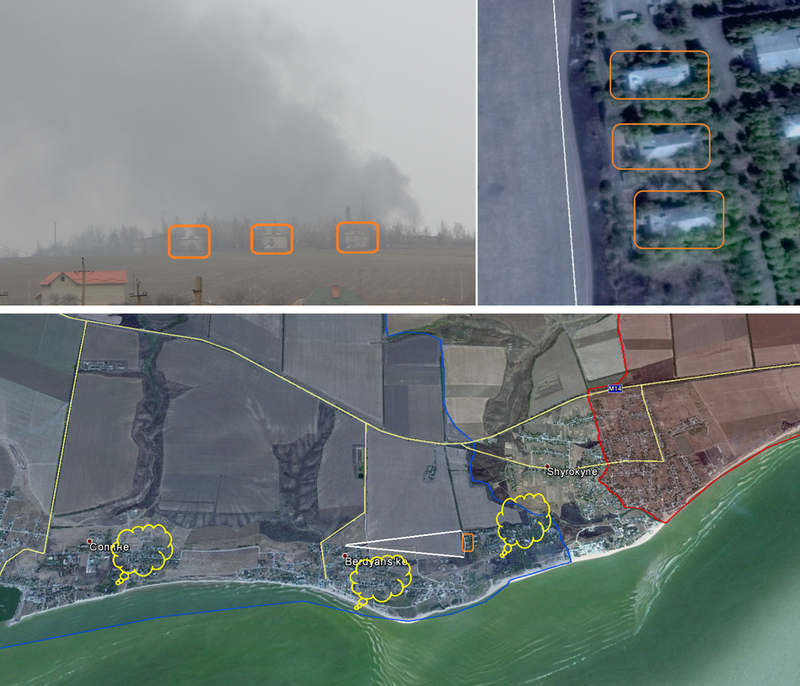 5 days later, on February 16, Russian forces started massive attacks on the front, pushing Azov troops out of Shyrokyne and to the town’s eastern outskirts (geolocated) in a first stage of their counterattack. 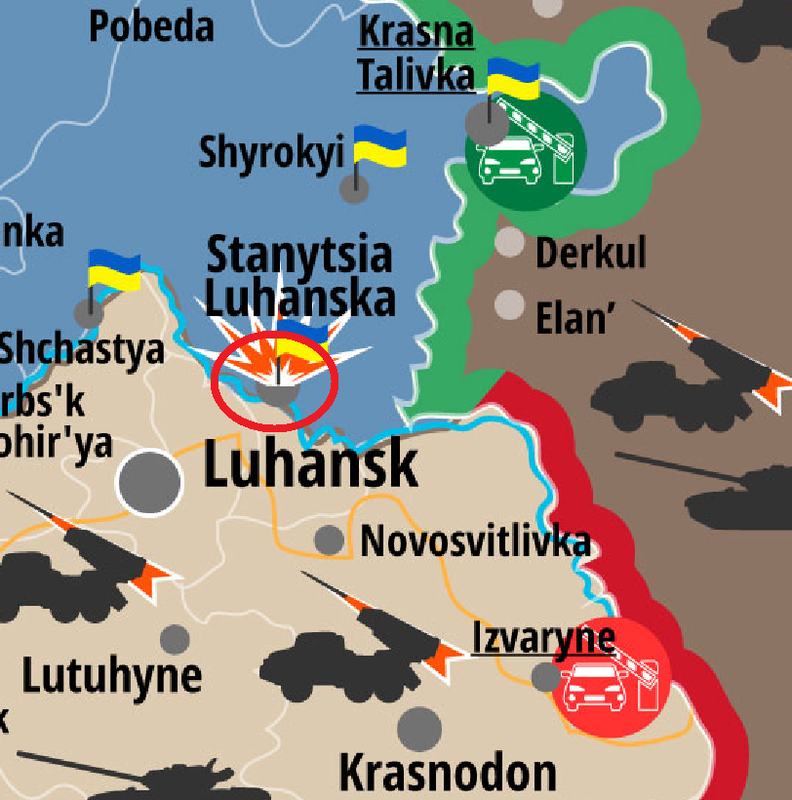 Several days of relative calm followed, but on February 23, their offensive gained pace again, using all kind of weapons – of course – forbidden in the Minsk 2 agreement – and even Russian air force surveillance planes over the occupied territory. The below detailed map shows what was used where and what the initial situation in terms of territorial possession at that time was. 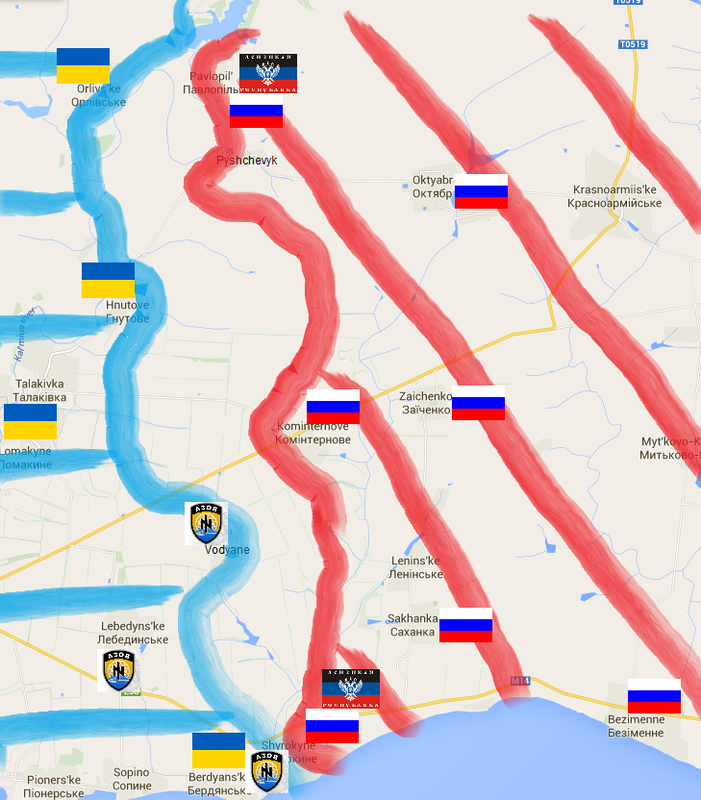 Due to the (anti!-)Ukrainian strategy of adhering to the Minsk 1+2 agreements, defending Azov troops could only fight back with small arms and mortars, by far not strong enough to resist the fresh Russian push, executed by forces coming from central Donbas via Telmanove as well as via Novoazovsk and thus directly from Russian army and invasion bases across the border (article). Reports from the Information Resistance group say up to 600 invasion forces stand ready to take part in the offensive as well as dozens of tanks and armored fighting vehicles, not to speak of heavy artillery and MLRS systems. As a logic consequence of the uneven (allowance to use) force, Ukrainian troops initially had to withdraw from Kominternove and shortly after from Pavlopil and its tiny suburb Pyshchevyk, meaning a loss of some 70% of the territory, Regiment Azov liberated earlier this month. Not even today, as the Ukrainian ministry of internal affairs report the use of Russian army T-72 tanks to attack Regiment Azov positions near Shyrokyne, the Ukrainian army command would give its troops the needed artillery cover. The below map shows the situation as it appears according to all available reports on February 25. 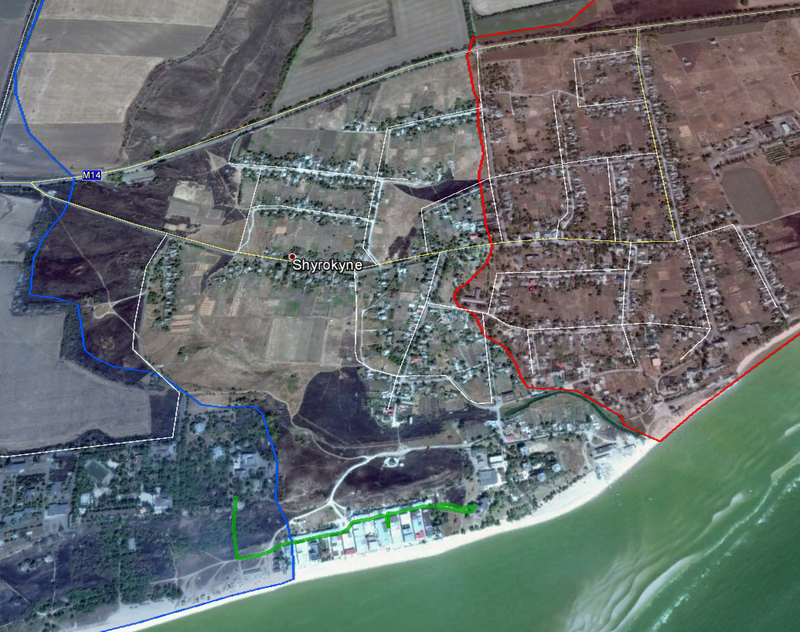 Last but not least, many people keep asking if Russian forces will attack Mariupol itself and capture it in another step to build a land corridor to (also-)occupied Crimea. There should be doubt about that for the coming weeks at least. 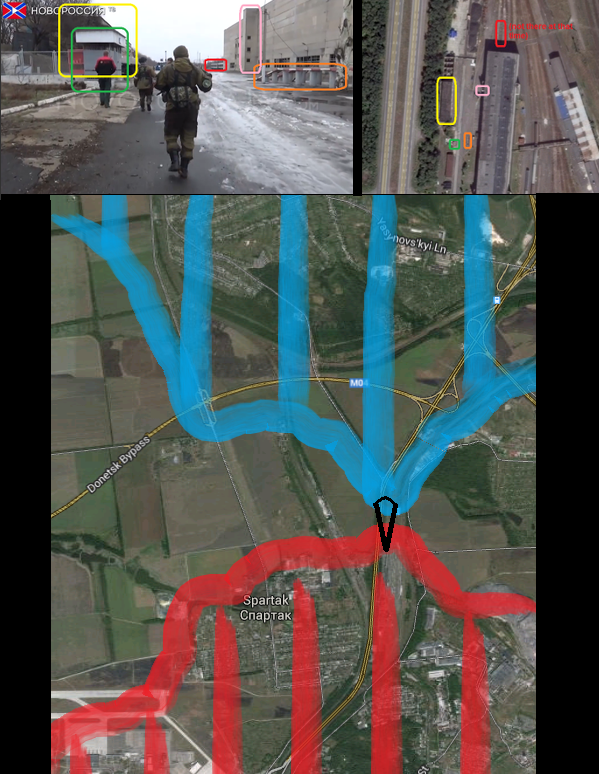 While some analysts believe, the Russian army and local separatists might directly attack or bypass and encircle the town, the cost for that move might be massive and possibly too high for both sides, especially taking into account that – different from Debaltseve – here both sides will have a steady streeam of resupplies and reinforcements until cutting the opponent’s supply lines with extreme force. Thus, the more likely scenario in the short term is that Russian forces will try to get back into the comfortable situation of controlling all smaller settlements east of Mariupol, being able to attack military and civilians targets in and around the town like it was the case between September last year and January 2015. Doing this, they would be able to inflict constant smaller casualties on the fixed Ukrainian line of defense, keeping the conflict boiling on a low but steady flame. At the same time, it would enable them to raise the stakes (attack Mariupol itself) whenever their supreme command in Moscow feels to do so, without having to move larger contingents of men and material (more than 5 kilometers). 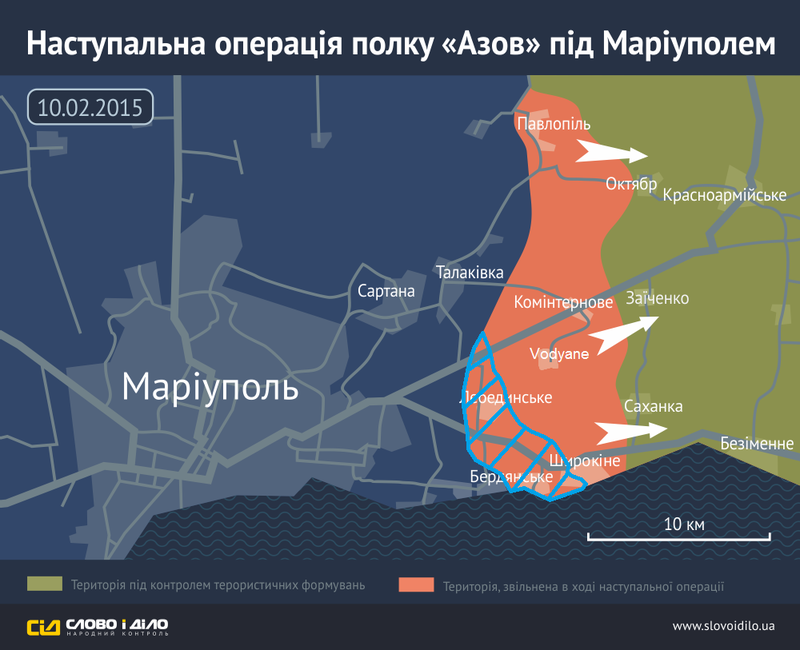 Finally what we might see during the next weeks and probably months will rather be an offensive towards and not on Mariupol. However, this offensive is already happening as we speak, kept dead quiet by both, the Russian and the Ukrainian government, but painfully felt by mostly volunteer Ukrainian defenders on the ground as well as civilians, coming back under Russian rule or – like so many others – being forces to flee to Mariupol itself or other safer regions in Ukraine.